All-Type Welding and Fabrication's clients turn to us for their most challenging welding and fabrication jobs. Through fabrication of this project, ATWF proved that when quality counts, our customers count on us. 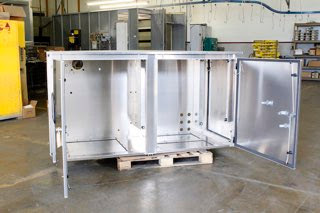 All-Type Welding and Fabrication’s team of welding and fabrication design experts custom fabricated an aluminum electrical enclosure assembly for a client in the power distribution industry. This specific project came to ATWF because we were already providing exemplary results for the customer. Because of this, incredibly high expectations were set for the ATWF. Ultimately, we proved to be more than qualified and met all of the necessary requirements, once again resulting in an extremely satisfied customer. For more information about this project, download the full Project Profile below. All-Type Welding and Fabrication, Inc. gets a lot of its business through word-of-mouth, and those endorsements make us proud--they show we're meeting or exceeding customer expectations. But it's potentially even more rewarding when a current customer continues to grow their relationship with us because they’re so satisfied. In one such case, we got a challenging custom fabrication job based on the quality we were already delivering for a customer in the demanding energy distribution industry. The energy distribution customer had exceptionally high standards and needed custom aluminum electrical enclosure assemblies (cabinets). They were already familiar with ATWF’s work because we supplied them with other various fabricated components. Based on the quality of workmanship on those projects, they asked that we evaluate the cabinets that another vendor had manufactured, which were poorly welded and covered in scratches. Because our expertise allows us to meet the needs of some of the most demanding customers in the metal fabrication and welding business, including aerospace, military and medical devices, we were confident we could exceed the customer’s expectations and provide an excellent outcome. ATWF has certified welders and finishing processes that can consistently adhere to customers’ meticulous specs. We quoted the job and made a first article unit. The cabinet immediately met all the dimension and finishing demands, which required it to have no surface scratches and only the highest-quality MIG and TIG welds. 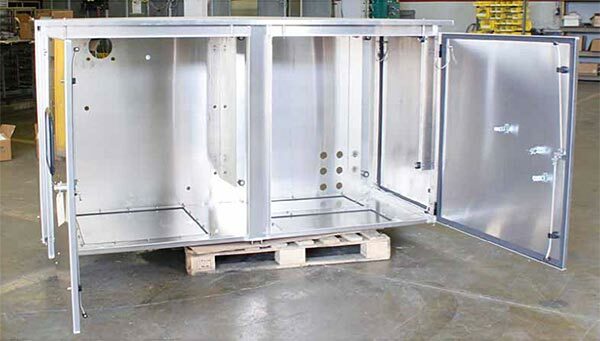 This highly successful product resulted in ATWF becoming the customer's go-to resource for many aluminum and stainless steel cabinet fabrications. Our welders boast decades of experience and an array of American Welding Society (AWS) certifications, which allow them to meet any job requirement. Our experts also have some of the most sophisticated cutting and forming equipment in the world. We can handle just about any challenging welding and fabrication job—even on difficult materials like aluminum, stainless steel, Inconel and more. ￼ Working with the customer’s CAD designs, ATWF started with aluminum that was 0.125“ thick, and began by cutting with the Trumpf TruLaser 5030 followed by bending/ forming with the Trumpf TruBend 5230. After MIG and TIG welding, we assembled the product according to the customer’s needs and specifications, applying the correct nuts, bolts, hardware and gaskets, in addition to applying Loctite adhesive to threaded connections and torquing fasteners to spec. The enclosure had a scratch-free mill finish and met all aesthetic as well as practical needs. ATWF was able to take the customer’s CAD drawings and build a working cabinet quickly. The product was shipped by the time many other providers would have still been working through prototyping, saving the customer the time, hassle and money. The completed product weighed 200 pounds and measured 78” long, 44” high, and 36“ wide. ATWF worked within a tolerance of ±0.010”. After a thorough round of inspections by our welders and in-house inspectors, full quality was ensured. We shipped the aluminum enclosure assembly to the client in Pennsylvania and they were very pleased with the service and production. If you want a superior fit and finish of any metal fabrication job, contact ATWF. No one in the industry meets higher standards. Product Description An aluminum enclosure assembly used within a power distribution application. Assembly: Assembled with correct nuts, bolts, hardware, and gasket. Applied loctite to threaded connections as indicated by customer. Torqued fasteners according to specs provided by customer. Overall Part Dimensions Material Thickness: 0.125" Width: 36" Length: 78" Height: 44"